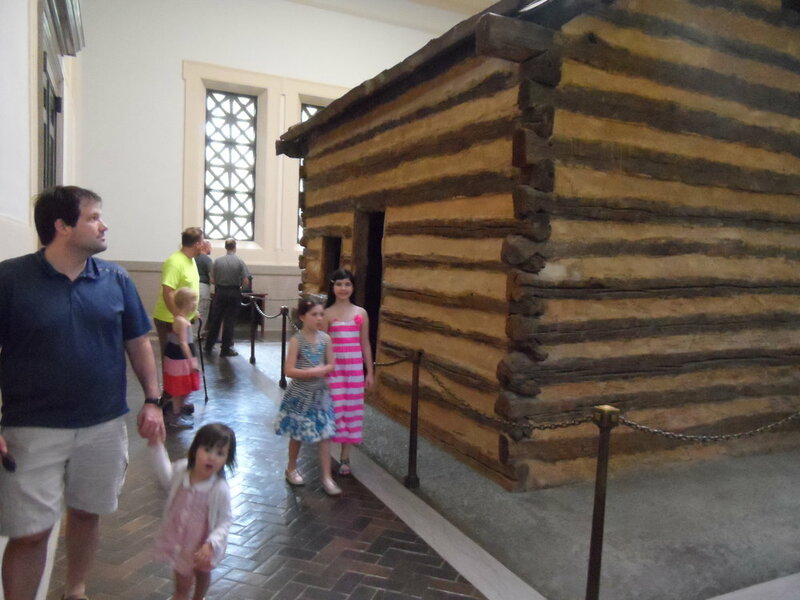 We recently made a visit to the National sites dedicated to Abraham Lincoln in Kentucky. There are some others in Indiana as well, but these are the earliest. I highly recommend planning this visit in warmer months, as the most impressive part is touring the grounds. "I was born and have ever remained, in the most humble walks of life." His early homes are evidence of that, as they show the typical life of a Frontier family of his time. Abraham Lincoln's family moved around quite a bit due to some unforeseen hardships related to instability in the family's claim to land titles. His birthplace home and first boyhood home are very close to each other. The first home was Sinking Spring Farm, a modest and typical Pioneer farm. The original cabin here was lost, but the National Park Service reconstructed a symbolic cabin here inside a massive stone Memorial Building dedicated in 1911. Just below the Memorial Building, you will find a Spring, called "Sinking Spring". You can walk down the stone steps to see the Spring well as it appeared in Lincoln's time. You can imagine the family using this water source and I was able to explain its importance to my daughters. The site also has a visitor's center and the grounds are currently under renovation, it appears to improve the walking paths to the Memorial Building. The construction site is very clean and did not interfere one bit with our visit, even with little ones running around. The wooden walkway is beautiful and provides very easy access to the Memorial. The visitor's center features a film about Lincoln and a reconstruction of the inside of a typical pioneer home. They also offer Junior Rangers programs, all these things are free of charge. 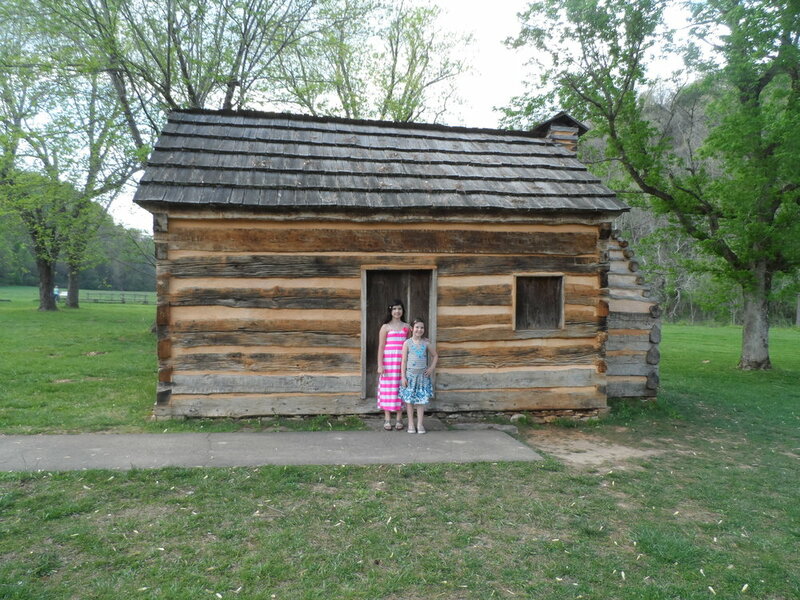 Just ten miles Northeast of his birthplace cabin, you will find Lincoln's boyhood home at Knob Creek. "I was born February 12, 1809 in Hardin Country, Kentucky. My earliest recollection, however is of the Knob Creek place." (NPS National Historic Park Brochure, 2017). The lands surrounding this landmark are impressive. The rolling mountains provide a calming presence, and the lush greenery let's you imagine life as Lincoln must have experienced it in his boyhood days. There are some towering trees that provide shade for a moment of reflection. On this property, you will find a log cabin which has been reconstructed from the wood of the original cabin. You will also find a larger structure next to the cabin, once home to a Tavern for traveling visitors. There is a beautiful, serene nature at this farm, and it lets you imagine some of Lincoln's own recollection of his childhood. The land itself was on 30 acres, with fertile land for crops and a nearby creek often described in Lincoln's stories. It was here where he played and almost drowned as a boy. The Knob Creek area was also home to a Separatist Baptist congregation that disapproved of slavery, and it was probably here where Lincoln began to formulate his later views on slavery. According to the NPS brochure, Lincoln said that his family, "removed to what is now Spencer Country, Indiana . . .partly on account of slavery. . ." and also on account of eviction due to a prior claim on the land, and relocated to the free state of Indiana. There is a natural trail along the waters of Knob Creek and a hiking trial giving an overlook of the valley below. To continue the tour of Lincoln's life, the National Parks established the Lincoln highway Trail, to follow the family's route through Kentucky, Indiana, and Illinois.